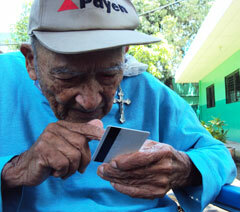 In honor of International Day of the Elderly, weíre featuring Federico Antonio, a sponsored 103-year-old in El Salvador. He lives in a Catholic home for the aged. His sponsorship benefits are given to the home, and the sisters provide him with food and other supplies. Read on to learn why heís lived so long! 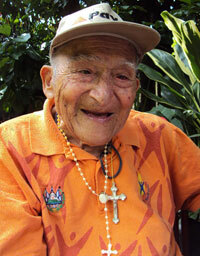 Federico Antonio, a sponsored 103-year-old in El Salvador. What is your name? Federico Antonio. How was your childhood? My childhood was humble. I did not have much upbringing, no education. I didn’t study. I had lots of difficulties. I was poor, and that is what I most regret. Were you raised by your mother and father? Only by my mother. My father died when I was an infant. Were you the oldest? No. I was the youngest. I am 103. My mother died at 105. What year were you born? 1907. Did you marry? No, I did not marry at all. Do you have children? No, I don’t have children. Why didn’t you marry? I didn’t have the means. Before, you paid 30 colones (6 U.S. cents) to get married. Imagine. And after that, you still had to eat, get a house and all the other things. Others can suffer, but me, no. If I am poor, I will suffer alone. But I had a girlfriend who told me, “Let’s get married.” But I always told her, no. Her name was Emilia and she was very pretty. But I didn’t want to marry, even though I intended to earn something to take care of her, but I wasn’t able to. I planted corn fields, but I couldn’t earn anything because the soil wasn’t good for corn. So, I learned to make bread and intended to get married at age 28, but I couldn’t. In your youth, what work did you do? I was a day laborer. I cleared fields with a machete. I cleared coffee fields with a machete. The military accepted me. I learned to cut poles. Did you live alone or with your siblings and mother? We lived together, with my mother, until she died. Did your siblings play with you? Yes, we played and they beat me up and wrestled with me. I had to climb a tree to get away from them. And how do you feel now? I feel calm, at peace. I feel happy. All the sisters are good to me. They give me two blankets to sleep with. It is because of the grace of God that I am so good here with the sisters. When I celebrate a birthday, they treat me like a king and I like to break the piñata. What do you like most about your birthday celebration? Taking my picture. I like to pose. What did you do in your youth? I always worked and took care of myself, and I couldn’t even be a military corporal. I was very discouraged but I continued moving onward. Since I was young, I didn’t receive advice from anyone. I grew up in poverty. I didn’t learn to read. Didn’t receive culture. Before, you paid for school and my mother was very poor. She fed us “guineos majoncho,” or large bananas cooked different ways, stewed and plain. Since we were five siblings, she raised us herself. She worked all day for 6 cents ironing. My mother was beaten down by this work and I know she saved for her children. Federico Antonio reads his ID card. In spite of his advanced age, he can still read small letters without the use of glasses. How was life then and now? Before, it was very bad, because they paid my mother 6 cents a day. When we ate bananas and yuca, we were very content. What do you do to stay so strong? I laugh. How do you do it? The will of God, nothing more. I pray Psalm 128 every night. Perhaps this is why I am still here. Did you go to war? Yes. I went to war and only got two bullet wounds. I was in the military hospital nearly five years because my spinal column was hit and my body is useless. But you are always happy! Yes. By God’s grace, I am not the sad and melancholy type. I see old people who are sad and lamenting their situation. This is how you die quickly. I am not afraid of death. I have looked at death three times. She is very tall and thin. I asked her, “Who are you?” She told me she was death. She showed me a hook in a very pointed walking stick. If I carry a hook as a scepter, it’s the scepter of death, and she missed me a lot, she said. In the farm where I worked before, a laurel tree fell on me and knocked me unconscious for nearly one day. It left me half dead. That’s when death visited me another time. What advice do you give to young people to have a long life? Know how to live, and don’t hang with a bad crowd. Respect the elderly and listen to advice from your elders. Also, you should marry just one woman because she will be your partner for your whole life, but take care who you marry. You marry for life and it’s better to marry and not get burned. The beauty in a person is the friendliness and honor they show. Being poor doesn’t have to discourage us. It should motivate us to improve and better ourselves. Thanks to Daniel Hernandez and Naresly Calitto, interns at CFCA’s El Salvador communications center, for conducting the interview and taking photos. Frederico, you have brightened my day. Thank you for sharing about your life.